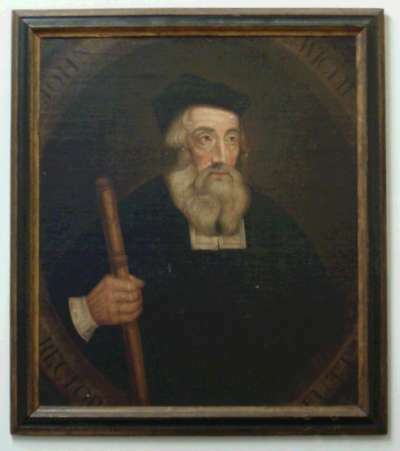 The portrait of John Wycliffe shown here is dated 1786 and was originally fixed to the sounding board of the pulpit. It has now been framed and hangs in the church. The following information is taken from the church guide by the Rev. Peter Casswell (Rector 1978 to 1991). Leaflets are available in church. There are several ways of spelling his name, different dates given for his birth and various opinions about the significance of his influence. I found the book written by David Fountain for 1984 and published by Mayflower Christian Books a sympathetic and very readable account and would recommend anyone to start there for an understanding of his place in the history of our Church and our country. Born in or near Wycliffe in Yorkshire, he first appears in the records as a scholar at Oxford, where he spent most of his life and expressed his views in his writings and by his teaching and debating about the state of the Church. Most of his writings had greatest effect on the Continent, influencing Huss and later Luther, and undoubtedly laying a foundation for the Reformation. His outspoken criticism of the Church and its hierarchy wherever he saw affluence or power which was not accompanied by the Spirit of Jesus Christ, attracted the support of Parliament and of some of the nobility, notably John of Gaunt. In 1374 he was one of four commissioners sent by King Edward to meet Papal delegates at Bruges. They were complaining at the high “tax” demanded by the Papacy and the growing tendency for the Pope to appoint the Bishops and other clergy from among foreigners, who took the stipend, but sent poorly paid substitutes to do the duties. It is thought that the King may have appointed Wycliffe to Lutterworth as a reward for his services on this occasion. Wycliffe certainly had a closer insight into the Papacy through his visit, rather as Luther later had from his visit to Rome. However Wycliffe’s writings against some of the teaching of the medieval Church, especially the dogma of “transubstantiation”, lost him some of his popularity and brought down upon him the censure of the Church authorities. He was cited to appear at St. Paul’s in 1377, but the hearing broke up over matters of procedure, prompted by John of Gaunt and Lord Percy, Earl Marshall of England. He was again summoned to Lambeth Palace, but this time the popular voice and then the intervention of the Queen Mother prevented him being condemned. The third time he was cited to appear before the authorities, this time in Rome, his declining health made it impossible for him to comply, so that it was not until long after his death that he was eventually branded a heretic, his books and his bones burned. It was during his last days at Lutterworth that he initiated the great work for which he is particularly remembered – the translation of the whole Bible into the English language for the first time. This was before the time of printing, so copies were costly and rare, but he sent his “poor preachers”, later nicknamed “Lollards”, through the length and breadth of England with portions of the scriptures, and preaching the Good News of the forgiveness of sinners through the death of Jesus Christ. We try here in the Church where he died to follow his threefold example – to keep the Bible as an open book for all to read and understand, to share the Gospel with all people and to try to maintain the truth of Christ in our teaching and our worship. The John Wycliffe memorial in St Mary’s. ‘John Wyclif – Myth and Reality’ by G. R. Evans.